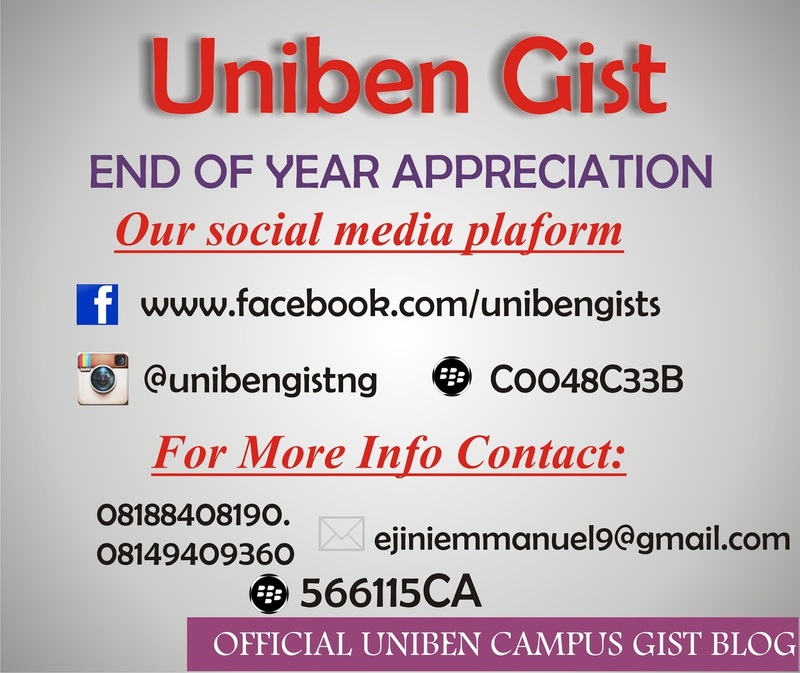 UNIBEN GIST: End of Year Appreciation to All UNIBEN GIST READERS. 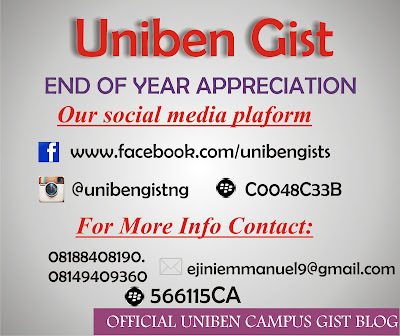 End of Year Appreciation to All UNIBEN GIST READERS. As 2015 ends in some few hours.. Am using this platform to say a BIG THANK YOU!!! I LOVE YOU!!! I APPRECIATE all Uniben Gist Readers For your support and love Thanks you all for believing us and making our career this year 2015 a SUCCESS! You guys have been really amazing though we started late this year 2015, but you all accepted Unibengist and the pageviews has been massive. I owe you guys so much for your love and support towards Uniben Gist Brand. I want to let you know that Uniben Gist is coming Bigger and better in the year 2016 and in other years to come. Many packages will be introduced both on our website and our social media platforms (Facebook, Instagram and BBM) also on Uniben Campus. To everyone who has in one way or the other assisted me morally and otherwise I appreciate!. To those who i have offended knowingly and unknowingly also to those who have posted some questions in our various platforms that we haven't answered please forgive us. This year 2016 we will try as much as possible to answer your questions as quick as possible. To those who have the wrong perception towards Uniben Gist please come closer & know us well before you strike with words. This is a platform for promoting THE GREAT UNIVERSITY OF BENIN and its STUDENTS. Please feel free to always comment and be active, doing so will help us know how you feel. We will be taking account of those who comment on Uniben Gist Blog. Please endeavor to represent us in your various classes and faculties. 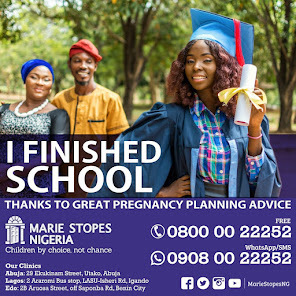 Continue to visit our site and encourage your friends too. Always view and share our post to other, even if the post or article may not meet your present need, but it may be beneficial to your friends. Your effort in doing so will be deeply appreciated. Also encourage your friends to join us.